Take a look at the many ways Pionite products can work to enhance the design of any healthcare facility or even your home. 1) High Pressure Laminate (HPL). A high-quality decorative laminate with the durability to preform in demanding locations. 2) ThermoFused melamine (TFM). A rich palette of colors in woodgrains, solids and natural stone to complement or enhance your enviroment. 3) DecoCor thick phenolic core laminate ideal for the workstations and partitions. 4) ChemGuard chemical-resistant laminate. 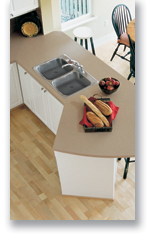 A chemical resistant laminate that offers protection throughout its entire thickness. 6) FRP Fiberglass Reinforced Plastic. An extremely durable wall and ceiling panel that is moisture, mildew and chemical resistant. the counter and you will receive a $5.00 rebate.